Early diagnosis and proper conservative management can lead to good outcome even for an unstable hamatometacarpal dislocation. 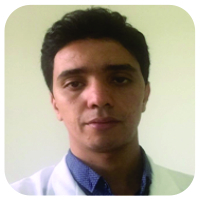 Department of Orthopedic Surgery and Traumatology, Military Hospital Mohamed V (HMIMV), BP 10100 Rabat, Morocco. 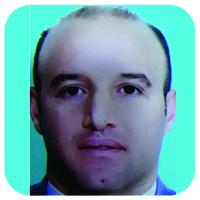 Department of Orthopedic Surgery and Traumatology,Military Hospital Mohamed V (HMIMV),BP 10100 Rabat, Morocco. Introduction: Pure isolated dislocations of the fifth carpometacarpal joint are extremely rare. To the best of our knowledge, the case, we present here, is among the extremely rare cases report of an unstable hamatometacarpal dislocation(HMD)injury successfully treated by a well-molded cast. Case Report: A 30-year-old rider fell from his horse, causing swelling of the wrist and the fifth finger was rotated with minimal active motion. The radiological assessment (X-rays and tomography) showed a pure HMD. Under sedation, we performed reduction of the dislocation. However, the reduction was lost at the slightest movement requiring a K-wirefixation. The patient refused the surgical treatment and requested non-operative treatment. Thus, while the joint was held in a reduced position, a well-molded plaster cast was applied which immobilized both the hamatometacarpal joint and the metacarpophalangeal joint. Later, the patient was reviewed weekly until 6 weeks, then the cast was removed altogether and the digits were mobilized. At the follow-up of 6 months, he had regained full range of motion of the little finger with no pain, no recurrence of dislocation and returned to his previous level of sporting activity. 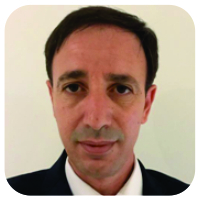 Conclusion: The early detection with careful clinical assessment and radiological analysis for subtle signs, followed by appropriate treatment usually leads to an excellent result. Keywords: Hamatometacarpal, Dislocation, Diagnosis, Treatment. The carpo-metacarpal dislocation entity represents<1%of all carp lesions . Pure isolated dislocations of the fifth carpometacarpal joint are extremely rare. McWhorter, in 1918 , was the first to characterize this dislocation and to describe its clinical presentation. This injury can be very easily overlooked if the attending doctor is not aware of the clinical signs and the subtle radiographic findings, leading to long-term pain and weak grip strength [11, 12]. 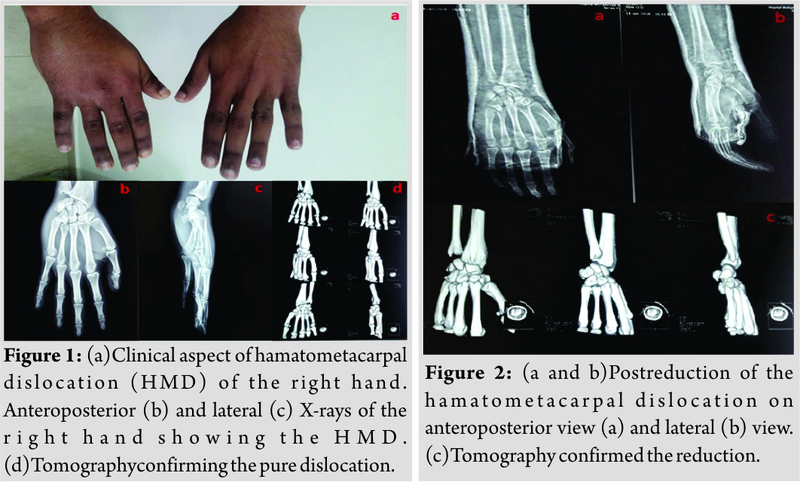 Stable hamatometacarpal dislocation (HMD) can easily be treated by manipulation and casting. However, an unstable injury always requires a K-wire fixation to stabilize the carpometacarpal joint . To the best of our knowledge, the case, we present here, is among the extremely rare cases report of an unstable HMD injury among horse riders successfully treated by a well-molded cast. A 30-year-old rider fell from his horse, landing heavily on the ulnar border of his right hand causing severe pain then transferred to emergency department. On examination, we found swelling of the wrist(Fig. 1a)and the fifth finger was rotated with minimal active motion. The radiological assessment including X-rays (Fig. 1b and c)and tomography (Fig. 1d) showed a pure HMD. Under sedation, we performed a longitudinal traction of the finger and a volar displacing force was applied to the base of the fifth metacarpal, leading to a satisfying reduction. However, after reduction, the joint remained unstable dorsally which required a K-wire fixation. However, the patient refused the surgical treatment and requested non-operative treatment. Thus, while the joint was held in a reduced position, a well-molded plaster cast was applied which immobilized both the hamatometacarpal joint and the metacarpophalangeal joint. The position was confirmed on X-rays and tomography (Fig. 2e-g). After 2 days, the swelling had subsided and the cast was changed. Then, the patient was reviewed weekly. After 6 weeks, the cast was removed altogether and the digits were mobilized. At 4 months, the functional result was satisfying with good muscular strength and complete recovery of wrist mobility in flexion-extension and fingers mobility(Fig. 3a and b). The hamatometacarpal joint remained stable(Fig. 4). At 6 months, the patient returned to his previous level of sporting activity and has been discharged from our care. The hamatometacarpal articulation is a saddle joint with a convex base of the fifth metacarpal fitting into a concave facet on the hamate. Both bones have an additional flat facet for articulation with the fourth metacarpal. 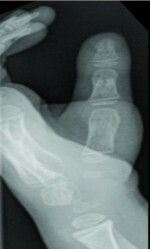 A striking feature of this articulation that distinguishes it from other CMC joints is its radioulnar slant in the frontal plane to allow 10–20° of supination, as shown when opposing the little finger to the thumb.This additional mobility comes at a price of increased instability with increased incidence of fifth CMC joint dislocation compared with the fourth CMC joint . The HMD is a rare injury, and only a few cases have been reported [6, 7]. It has been recognized to be of two types depending on dorsal or volar displacement, which may be easily missed on routine radiographs in a trauma patient[8, 9]. It concerns the young adult. Very violent traumas such as traffic accidents are the main ones. However, traumas of lower intensity, such as falls in height and punches, may cause dislocation of the moving metacarpal muscles . Although it is difficult for the patients to remember the exact mechanism of trauma, this injury is thought to be caused by a direct blow transmitted to the dorsal and ulnar aspect of the fifth metacarpal . The diagnosis of CMC dislocation is both clinical and radiological . The history is of a clenched fist striking a hard surface on its ulnar border. The dorsum is swollen with minimal rotation or shortening of the little finger. Anteroposterior and lateral views are most helpful. Some authors recommend a complementary computed tomography study . Once diagnosed, these injuries are easily reduced by manipulation under sedation; this may be successful up to 10 days after the injury. There after, unstable reduction should be held by a K-wire. After 3 weeks, open reduction may be required. In our case, the mechanism of injury was a fall on the ulnar border of a semiflexed wrist with a force directed to the head of the metacarpal. The hamatometacarpal joint remained unstable after reduction and continued to dislocate dorsally when flexing of the fifth metacarpal. We elected to provide the patient with a well-molded cast as the method of Syed AA et al . The reduction was held in place while the patient was followed up weekly; the plaster was changed as the hand became less swollen. Once the plaster was removed, the hamatometacarpal joint remained stable. We emphasize that undetected hamatometacarpal joint dislocation leads to disruption of longitudinal and transverse arches. The instability and arthritis caused by a missed HMFD can end a promising sports career. The early detection with careful clinical assessment and radiological analysis for subtle signs, followed by appropriate treatment can lead to a satisfactory outcome. TheHMDis a rare injury. Early diagnosis leads to early management, avoiding the instability and arthritis caused by a missed HMD. Non-operative treatment is possible for unstable dislocations and requires a strict surveillance. 1. Dobyns JH, Linscheid RL, Cooney WP. Fractures and dislocations of the wrist and hand, then and now. J Hand Surg 1983;8:687-90. 2. 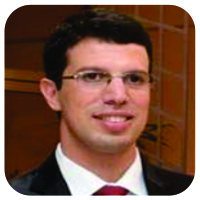 Valente M, Saggin G, Alecci V. Pure isolated dorsal dislocation of the fifth carpometacarpal joint. Musculoskelet Surg 2009; 93:97-100. 4. McWhorter GL. Isolated and complete dislocation of the fifth carpometacarpal joint: Open operation. Surg Clin Chicago 1918; 2:793-6. 5. Lilling M, Weinberg H. The mechanism of dorsal fracture dislocation of the fifth carpometacarpal joint. J Hand Surg 1979; 4:340-2. 6. Waugh RL, Yancey AG. 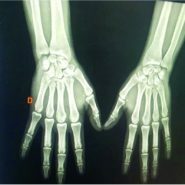 Carpometacarpal dislocations: With particular reference to simultaneous dislocation of the bases of the fourth and fifth metacarpals. J Bone Joint Surg 1948; 30:397. 7. Laforgia R, Specchiulli F, Mariani A. Dorsal dislocation of the fifth carpometacarpal joint. J Hand Surg 1990; 15:463-5. 8. Vijayasekaran VS, Briggs P. Isolated dorsal dislocation of the 5th carpometacarpal joint. Hand Surg 2000; 5:175-80. 9. Chen VT. Dislocation of carpometacarpal joint of the little finger. J Hand Surg 1987; 12:260-3. 10. 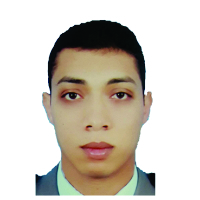 Henderson J, Arafa M. Carpometacarpal dislocation. An easily missed diagnosis. J Bone Joint Surg Br 1987;69-B:212-4. 11. Lawlis 3rd JF, Gunther SF. Carpometacarpal dislocations. Long-term follow-up. J Bone Joint Surg Am 1991; 73:52-9. 12. 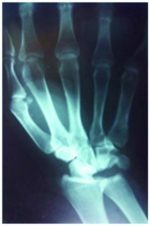 Fisher M, Rogers L, Hendrix R. Systematic approach to identifying fourth and fifth carpometacarpal joint dislocations. Am J Roentgenol 1983; 140:319-24. 13. Masquelet AC, Nordin JY, Savary L, Poulizak C. À propos d’un cas de luxation antérieure des quatre derniers métacarpiens. Ann Chir Main 1986; 5:63-6. 14. Nalebuff EA. Isolated anterior carpometacarpal dislocation of the 5th finger. Classification and case report. J Trauma 1968;8:1119-23.